It is always great to have a fresh start! A new year is a perfect time is look at what needs to be better in the months to come. It is a perfect time to think about changes personally and professionally. I have gradually started going through my attic and am clearing out space. Items I no longer want to keep, I am listing on Facebook and have started a travel fund for this year. Goal # 1 – Travel more! See more sites! Go places I love. Go places I have never been before. Goal # 2 – Work smarter, not harder! I need more playtime with my friends and family, as well as me time. I want to enjoy each day, smiling and laughing. That being said, I plan on setting aside time for my own projects. I love quilting for others, but I have projects of my own that I hope to begin, work on, and hopefully complete. Goal #3 – I hope to have a vendor booth at a few shows this year. I am not sure which places I will be yet, I am working on that the next couple of weeks. I will keep you updated as I know more. This quilt is called Cabin at the Lake. It is a block of the month class I will be teaching at Cindy’s Quilt Shop, in Caldwell, Idaho, this year. This quilt is called Atlantis. 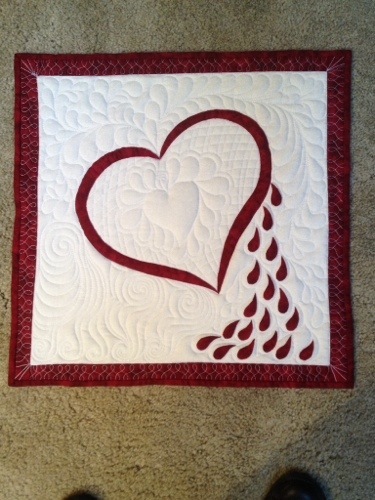 It is also a block of the month class I will be teaching at Cindy’s Quilt Shop in Caldwell, Idaho. Goal #4 – Teach again! It has been a few years since I was actively teaching quilting classes. 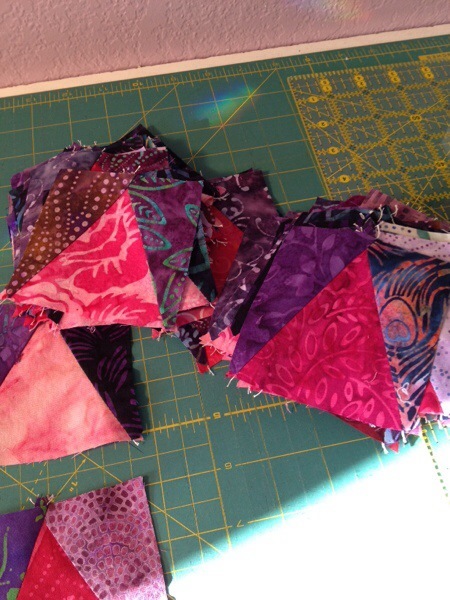 I am diving in, starting in February, to teach two block of the month classes, one advanced quilting class and a series of strip mystery quilts. I will be teaching these classes at Cindy’s Quilt Shop in Caldwell, Idaho. If you are interested in any of these classes, go to Cindy’s website to get more information on the classes, as well as sign up. I hope I get to connect with old friends and new ones in these classes. 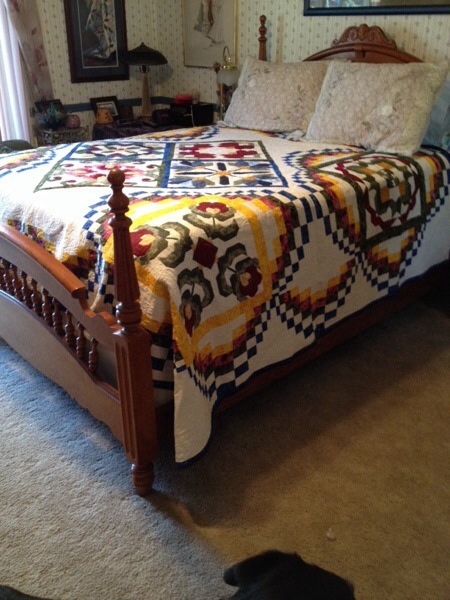 I have tried to take photos of all the quilts I have made and all the quilts I have worked on for clients. Most photos have been taken on the floor in my living room. Many photos show the tips of my shoes at the bottom of the photo. Some photos have been better than others, none have been the best. 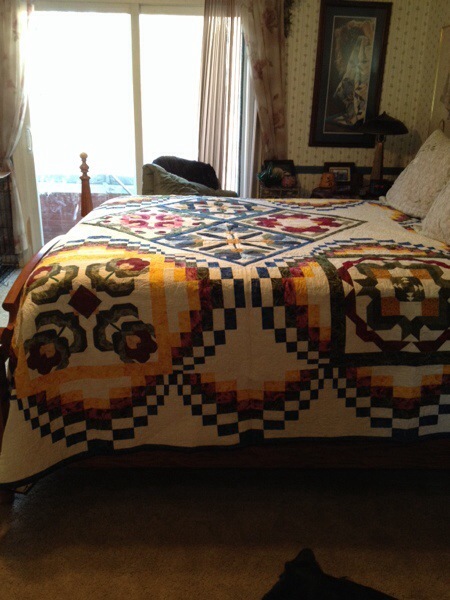 I have been doing some studying on ways to improve photos of quilts. I hope that the photos I take in the future will be better than they have been. i am also looking at doing some YouTube videos this year as well. I think this is related to my desire to teach more now. I have been a teacher all my life and I am really missing it now, so stay tuned! Listened to a great music duo tonight (Blaze and Kelly). They were so GOOD! Great crowd – hey helped me move into this new year with fabulous music! Enjoy this new year, enjoy the music, and definitely remember to be grateful for the blessings you have! I love waking early enough to see the light of the day starting with such beauty. Gratitude for the ability to see and recognize this beauty. It has been leaf season in my world. I have really enjoyed being outside working, breathing fresh air and playing catch with my sweet girl, Aspen, while filling bag after bag of leaves. First week for leaf collection. Second week of collection. Gratitude I have such great shade trees that provide shade and beauty to my yard. More gratitude that I am able to spend great time outside working in my yard. And Aspen loves playing with the leaf scoops and frisbee. 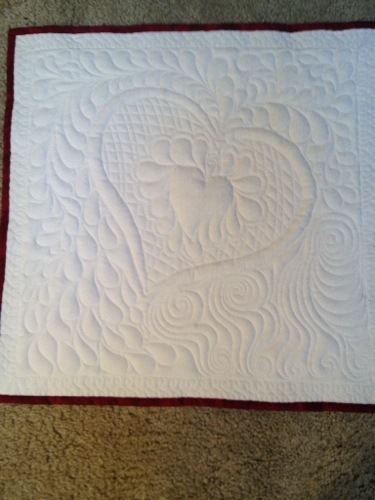 Finally finished quilting my daughter Kelli and son (in law) Tim’s wedding quilt. Did not want to mail it to them so hand delivered it. Gratitude to be able to see them, spend time with them, and feel loved with my family. The back of the quilt has the signed wishes, hopes, and advice for the their marriage and love for each other. Took me longer to make than I had anticipated, but am ecstatic with the look and feel of such a quilt to wrap them up in huge love from their friends and family. Leaving to to take the quilt to them was a bit stressful as I had to be at the airport at 4am. Once I arrived, having a sign to locate who they were was so helpful! (They have such a great sense of humor). I have huge gratitude for the wonderful children I have! So, I have a day or two before I finish the next client quilt and start on the next project. Am hoping to change the website a bit so that I can list some items in a shopping area for you (pantographs, pincushions, patterns, etc.). Hope it will go smoothly. I am not the best when it comes to technology. I would rather be Quilting! My schedule for longarm Quilting is filling for next year. 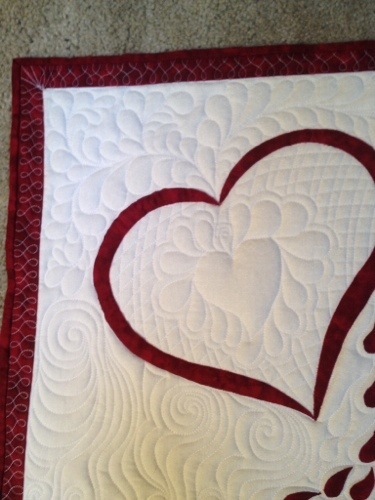 If you would like something quilted in January, I have one spot available. Call me and let me know if you would like it. It is for January 15, 2018……can you believe we are finishing this year already? I hope you all had a good Thanksgiving holiday. I know that everyone says they are thankful for this or that at this time of year, but I try to be thankful for every day I have. Some days are better than others, for sure. In order for me to be thankful, I must recognize ALL the blessings that surround me each day! It has definitely been a busy year. I had intended on posting more, updating my photo gallery, and printing new patterns this year. Alas, I have not had time. Keep posted as I hope to meet one or more of those goals. Remember, life is meant to be lived to the fullest. Be positive, loving and giving! Scheduling gardening, yard work, and quilting certainly becomes a juggling act at times. My yard is calling to me that it is becoming a hay field while I am quilting in the studio. Thank goodness I am as organized as I am. Nothing would get done if I let my attention drift. I have completed a couple of projects this last month. I repaired an antique double wedding ring quilt but forgot to take her picture. Too bad. She was gorgeous with a green background and prairie points all around the edges. I completed this memory quilt for a wonderful woman who lost her mother. 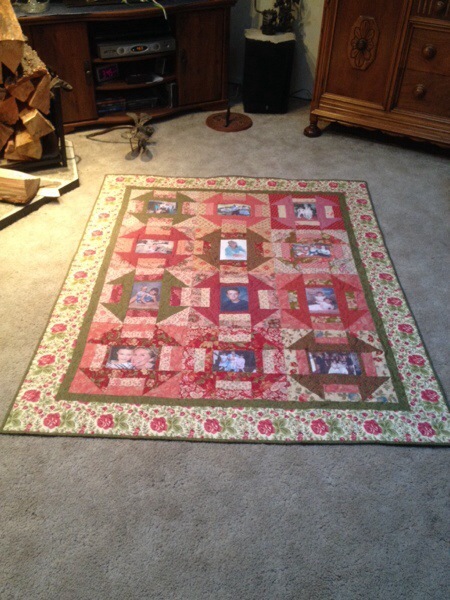 I hope this quilt gives her comfort as she shares memories of Grandma with her children. Memory quilts are a fabulous way to use clothing items of the person who passed and create a quilt to wrap around shoulders or lay in a lap and remember! I also have completed this very large T-Shirt quilt for a beautiful graduate! 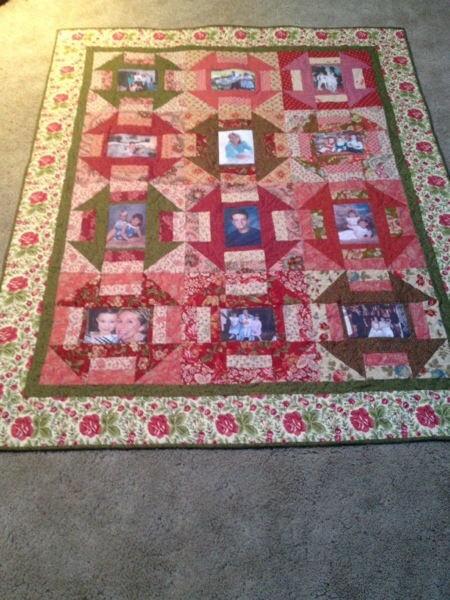 I really enjoyed making this quilt with all the different fabrics and photos added. It is a different layout than just a grid of T-Shirts. The time involved is more but it certainly was a darling quilt. I have another T-Shirt quilt ready to go into the frame, a top pinned to my zipper system and ready to go into the frame after the T-Shirt quilt, am piecing a double wedding ring quilt (only two rows to go) and am cutting out a new top. The garden is in and thriving, the iris are almost in full bloom, all the flower beds are weeded, am getting ready to paint three adirondack chairs and a bench, am working on my vintage trailer, Trixie, and am still “letting the grass grow under my feet”. Guess I need to fit in the mowing soon. Was working in the studio and this gorgeous dragonfly came to visit. Remember to be positive about life, count your blessings, and involve yourself in your passions. It is unbelievable how fast this year is moving. Seems like only yesterday . . . . It also seems that I say that more and more frequently as I age. I have been very busy during the month of February. Seems like, when it rains, it pours. So I just have to take deep breaths and move forward as best as I can. My Flying M piece was auctioned and brought a very nice price for a great charity. I am so thankful for the buyer. I loved the piece so much that I think I am going to create something similar for me. I have been working on this TShirt recently and finished it up for the customer. 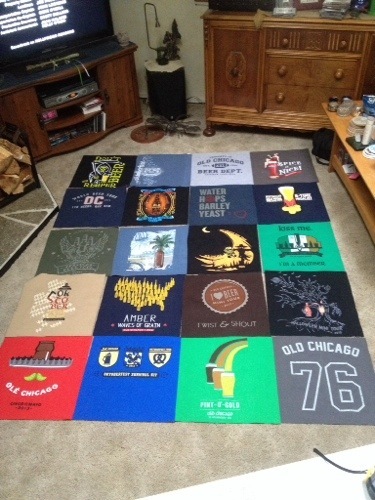 It seems to be the season of the TShirt quilt. I am finishing up on the one from last blog post. 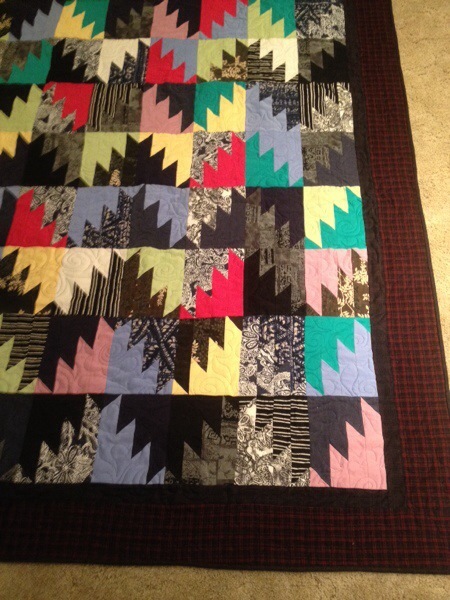 It is quilted and just waiting for the binding. I hope to have pictures of it for you in the next couple of days. With the tax season, it seems that everything is happening at once. My vintage trailer, Traveling Trixie is coming along on her renovation. Check out my blog: GlampingWithTrixie.wordpress.com to see what is going on with her. I am also having my furniture repaired (dining table base, and regluing a couple of chairs), my sofa and chair reupholstered, packing and moving everything out of my foyer, dining room, living room and hallways (including pictures on the walls) as carpeting is going to be installed. The bulbs are coming up outside and I already have blooming crocus. The garden is calling for cool weather crops to be planted. Of course, there is prep work to do before this happens. I also have several quilting projects for clients that are scheduled and keeping me very busy. If you have a quilt that you need made, or a top to be quilted,be sure to get on the schedule soon. I do not like being out more than a couple of months. Well, wish me luck on the upcoming projects and look for more photos to come in the next couple of days. Seems like every year at this time, I want to be outside enjoying the nice weather. I am being called to come enjoy the sunshine. The sun is out today, but the forecast is for rain, snow, and more cold weather. I always look at the bright side though. I need to do some spring cleaning, organizing of my studio, organizing of my fabric, and general paper work (tax stuff). Maybe I will enjoy today and tackle things tomorrow. My art piece for the Flying M’s Valentines for Aids event raised some money! I am not sure how much but any amount certainly helps. I am going to be a guest blogger for the APQS blog this next couple of weeks. I am very excited to be able to do this. It is going to be an article about how to decide what to quilt on a quilt. Wow! Just how do I explain that so it sounds good to the reader? I am currently working on it and will let you know when it is published and where. I have been very busy working on two Tshirt quilts and a Memory quilt. This is one that I am working on today. I still need to add a border to it and get it quilted. I am also putting the binding on the other one but forgot to take a picture. Guess I really need to be outside. So, I will give you more pictures when the day is not so nice. Call if you need to get on my schedule. I am really beginning to fill up and I know I need to build gardening time into my schedule.. Are your crocus up yet? I am going to look for mine……. Be thankful for all your blessings! January is always a non-productive month as the Holidays zap your energy. I am not usually productive during this month, but this year is definitely different. I do not have a lot of energy, but I am working away at my passion, quilting. I am working on a Double Wedding Ring for a client, a Mystery quilt for me (I do not usually take time to do something just for me), a Memory quilt for a client, and two quilts for my children, and the art piece for Flying M’s Valentine’s For Aids event. I am excited to have completed this Memory quilt so early in the new year. This piece is for a husband whose wife passed suddenly. The wound left is great. 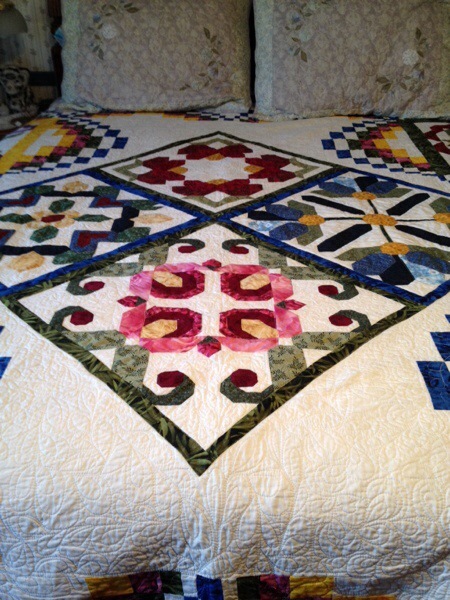 His daughter gathered her mother’s garments, picked out the quilt pattern, the border fabrics, the backing fabric, and the quilting design. I took it from there. It is always interesting to open the bag or box and see what garments you have to work with for the Memory Quilt. It is not like going to the store and picking out what fabric you will use for your next project. It is a challenge and it is a way to stretch and grow with your creativity. I do not usually have the client pick out the specific pattern. It seems easier for the garments (fabric) to “speak” to me about how they want to go together. A Memory quilt is a way to have that loved ones arms around you as you wrap up in the warmth of the quilt. Each fabric can trigger fond memories of times gone by. It can help with the healing of a wound as it provides such calmness and peace as quilts can do. I decided that I needed to change the quilt on my bed for the new year. 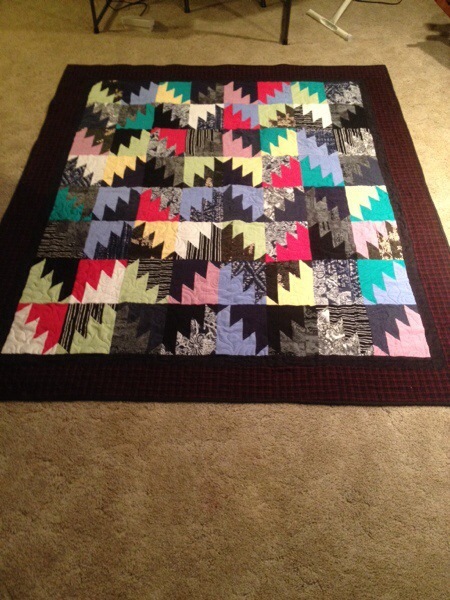 This is a quilt that I made a while ago. I actually made two of them, one for my sister and one for me. It is a BIG, bright, beautiful one. I just finished working on this Memory Quilt for a client. She provided photos of her grandmother’s grandchildren. I used Printed Treasures photo fabric to print as it is pre-treated and colorfast. I am currently working on a Memory quilt that is a bit larger than a lap size, and of course, I can never do just one thing. I am also working on a Mystery quilt with a friend. It is so much fun, but a lot of work. I decided to make a king size. Now that is a leap of faith – mystery and huge. Funny how every year at this time, we all think of organizing, cleaning, and purging our material things. This year, my approach is different as I am going to concentrate on my thoughts and processes instead of my physical stuff. I need to play more, laugh more, travel more, and quilt more. I need to be more organized in my thought processes so I do not revisit things many times. I want to spend time in places I love, but I also want to visit new places. Seconds, minutes, hours, days all count this New Year. I am ready for the challenge. Speaking of challenge: I have been invited to submit an art piece to the Flying M’s 21st year of Valentines For Aids. I have until January 27th to produce a small piece for the silent auction. I am extremely excited to have a challenge, to be invited, and to work on yet another quilt. Guess this New Year is going to be great, filled with fabrics and quilts! I cannot think of a better way to spend the year. I wish you a Happy New Year! May you make many quilts and begin to use up your collection of fabrics. It does not matter if I am designing, piecing, or longarm quilting, my shadow, Mia, is always around to lend a helping hand. She loves the sewing room and she loves the studio even more. She has a special bed in the studio and one in the sewing room so she can enjoy the day with fabric. How many of you love fabric? That will definitely be another post for the future. This darling applique quilt top was brought to me to be longarm quilted. It was so fun to swirl snow throughout the blocks and give a bit of movement to the piece. 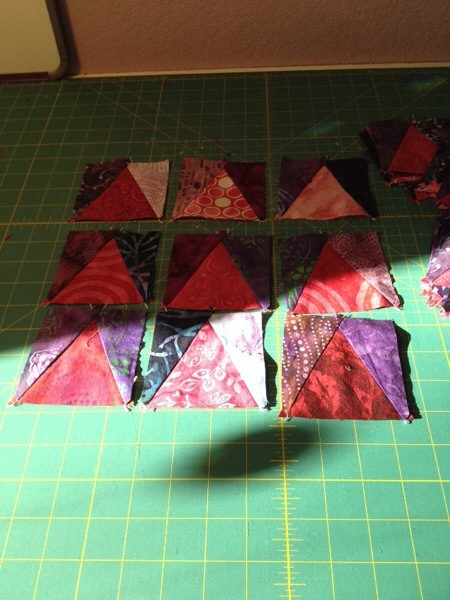 Each of the blocks were made by a different person in a small group, and then one quilter received these blocks and put them together into a quilt. I loved the detail and fancy that was added to the blocks. Just makes me smile. Here is another example of the connections in the quilting world that keep us motivated and inspired to make beautiful quilts with and for each other. Hang on to those quilting companions! They truly are invaluable. 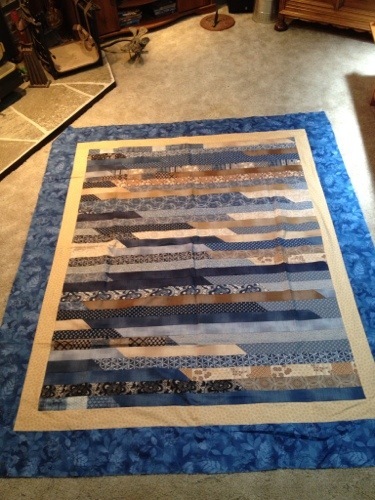 It feels great to have another quilt longarm quilted and off to the client. I know she will love having this during the Holiday season. I am working on my photo taking skills and hope that you forgive some of the pictures. In my excitement, I sometimes do not pay attention as I should. Anyway, another darling project completed!! Hope you take time to rest and relax during this busy season. I on the other hand am off to work on another project! August? Where Does Summer Go? Seems like everyone was complaining about how cold it was and then the heat sweltered all of us! It left me waving that fan and not really wanting to do much outside. But my garden seems to have loved the heat and now it is the deluge of zuchini for each and everyone of us. 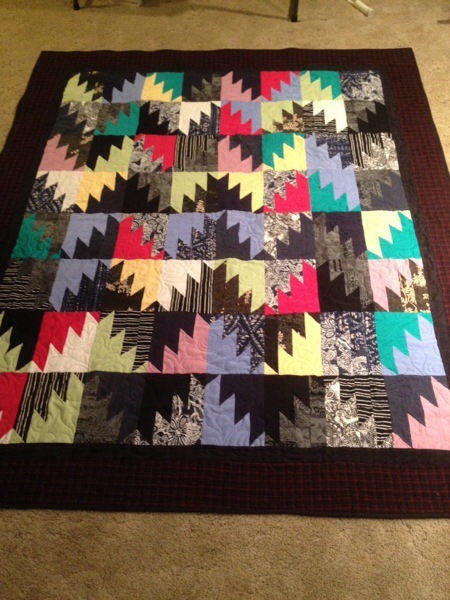 I have not wanted to do much quilting but have been diligent in my quest to complete the projects for my clients. There are many so I am working away and am very inspired by each of them. There are only a couple of photos this time, but I promise to have more as projects progress. This quilt is currently in the frame. I have designed a fantastic quilting design and am about half way finished with the quilt. I am using a double batt so the designs really pop on this one. I did forget to take photos of work in progress for this post so will add those soon. 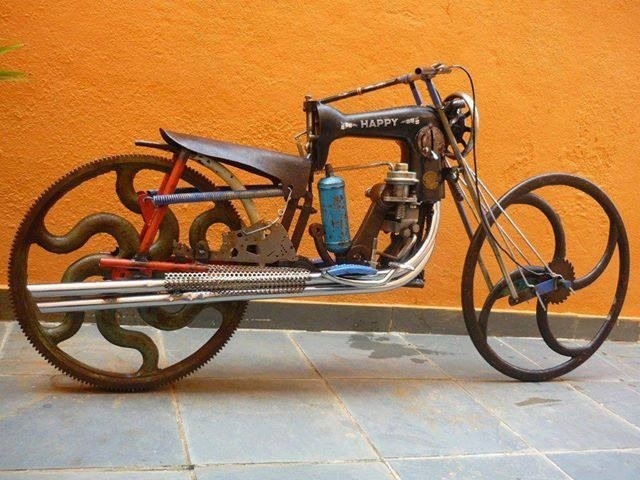 This is a fantastic bike that someone built. My son does custom bike work and I would love to have him make this for me. It is just plain awesome. I even have a friend who would donate the sewing machine. Maybe it could be my Xmas present!!!!!! I never seem to be able to work on just one project at a time. So I am finishing up a great Levi quilt. Pictures will soon be posted, I promise. And I am working on a Double Wedding Ring quilt. I have a client who wanted one, and I have a great friend that wanted to make one out of Batik fabric. We are getting together to work on them and motivate each other. What a great way to spend time with someone and accomplish something!!! I hope to have some pictures for you soon and keep you updated on the projects as I have been.